Whether it is hard Dollar or time and material, Rustex, Inc. can help you achieve your goals. We are looking forward to the opportunity to serve your needs. Rustex, Inc. was formed in 1981 as a subsidiary of T.H. Russell Co. The Company was originally developed to install and maintain natural gas processing plants, compressor stations and other related facilities on a limited basis. In 1990, T.H. Russell Co. offered to sell Rustex, Inc. to its minority stockholders. After consideration of the upward trend of the market, the strength of knowledge and talent of its personnel, and the potential for expansion, the decision was made to acquire the Company. 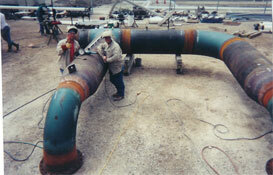 Rustex, Inc. has been growing to meet its customers’ needs ever since. These aspects need not change your deadline, nor long term goals and cost, if considered up front. Are you moving an existing plant? If you have the P & ID’s and vessel drawings, we can assist in designing your foundation and piping lay-outs without expensive engineering and drafting cost. Over the years, Rustex, Inc. has cultivated multiple alliances with other specialty Contractors. These alliances allow for coordinated turnkey projects for all phases of construction. Whether it is a hard dollar contract or a time and material job, setting and achieving target dates for project completion is essential for marketing your products and services. We will help you set and attain these goals. 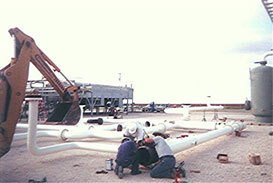 These are some of the projects that Rustex, Inc. has completed in the past. 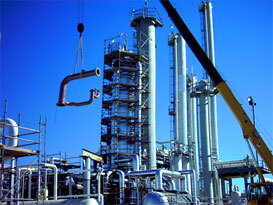 Modify three 15MMCF Refrigeration Plants to Phillips 66 specifications. Installed 10MMCF Refrigeration Plant with storage and truck loading facilities. Installed multiple Compressor Stations, Dehydration Units, and Pigging facilities. Aquila S.W. 1991 Somerville, Tx. Installed 30 MMCF Exspander Plant with slug catcher, stabilizer, 280 GPM Amine Unit, Glycol Unit, Flare System, Storage and Truck loading. Installed two Cat 3608 Clean Burn Compressors with containment and building. Modified inlet separation and fuel system. Installed one Cat 3612 Compressor, one Cat 3608 Compressor, three G-3016 Compressors, one Solar/Saturn Compressor. Installed two Inlet Slug Catchers, Inlet Separators and a variety of Plant modifications and upgrades. Disassembled and move 800 GPM Amine Plant with 60MMBTU Hot Oil System. Installed 400GPM Amine Plant and Glycol Unit, with environmental containment. Installed several Natural Gas Compressor Stations, Pigging Facilities, Meter Stations, Treating Facilities, and general construction as needed. Copyright © 2019 Rustex, Inc.